“They’re a great kids’ fish.” “They’re easy to catch.” “They’re a good management option for a pond too small to manage for trophy bass.” If you’re a serious bluegill angler, chances are you’ve heard someone denigrate your favorite fish. Chances are also good that you’ve come across conflicting advice on how to grow those monster ‘gills. Bluegill are the Rodney Dangerfield of freshwater angling – these days, even the once-reviled common carp gets more press. Which is the year I caught my first sixteen-ounce bluegill. A public lake near my hometown had been drained and re-stocked four years earlier and was putting out numbers of bluegill over ten inches. Word got out quickly, and within a year of when the big ones showed up, the lake had been hammered with fishing pressure and the lake’s population of bruiser ‘gills had been decimated, never to recover. But I was able to get in on the tail-end of its glory: I had three magical trips, for which I caught at least one pounder bluegill each trip, and two of the trips I had two that weighed a pound each. The average weight of the fish on the best trip was fourteen ounces. My life would never be the same. My bass obsession was obliterated like a scud missile that’s been intercepted by a Patriot. 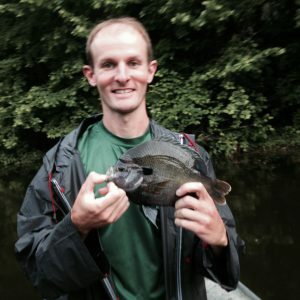 I began reading everything I could about catching big bluegill. (This was long before the internet existed.) My grandfather had a bunch of back issues of Fishing Facts, and I found an article by a fisheries biologist on catching bluegill over a pound. 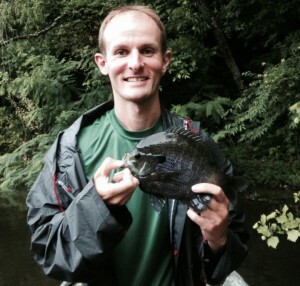 The author stated that most fisheries scientists that he knew had only a passing interest in bass, because their true passion was catching trophy bluegill. I found another issue of Fishing Facts about feeding bluegill pellet food. 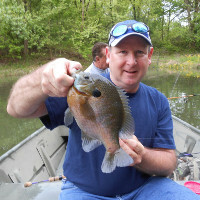 The author stated that bluegill could be grown to three pounds on supplemental food – and he backed it up with a photo of several enormous bluegill feeding on pellets inside a ring of PVC on a clear-water pond. That photo gave me a fever that no one but a fellow trophy ‘gill aficionado could understand. I read all the literature I could find on pond management, and I found a couple landowners who were willing to let me work with their ponds in exchange for fishing permission. I made rectangular retaining frames out of two-inch PVC and anchored them in three phosphate pits and began feeding the bluegill by hand with catfish chow on the weekends during the school year (I was in college at the time), and five days a week during the summer; two other ponds I managed by monthly fertilization and a release-only policy on largemouth so that they became stunted and kept the bluegill at low densities (more food per ‘gill). Within three years I was catching one-pound bluegill every trip at my two best ponds, and fish over a pound became common. But that was twenty-five years ago. The amount of information, and the management resources, available to any serious ‘giller today dwarfs what was out there when I started working with ponds. Today we have foods that have twice the protein content of the food I was using, and directional automatic feeders that sling the food far out from the bank or dock as their solar charger keeps the battery charged; pond owners in Southern states can purchase Florida-strain bluegill (they’re called coppernose) that grow faster and larger than the northern-strain I was feeding on weekends. But just as every other pursuit one might adopt these days will have its share of misguided or simply erroneous info, so too does growing giant bluegill. And just one bit of well-intentioned but bad advice can mean the difference between a pond full of giants and a whole lot of frustration and wasted money. I’m going to list a few common mistakes that keep pond owners from growing giant bluegill in their ponds. Avoid these like the plague, and you’ll be on your way to having the biggest ‘gills in the county. 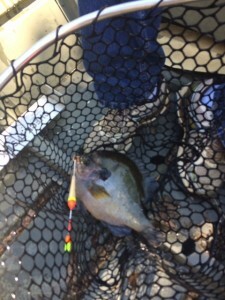 Big Bluegill Mistake #1: Worrying about bass size. Any good pond pro who has grown big bass will tell you how key density is in the process. Too many small bass equals not enough food for the medium-sized bass to get big, not enough food for the big bass to get even bigger. In ponds where the bass are significantly overpopulated, few of the bass ever make it beyond fourteen inches, and that fourteen-incher may be six years old. Thin out the small bass, they’ll tell you, or you’ll never have any big ones. You can stock forage all day but if you don’t thin out the skinny runts they’ll devour all that forage before it has a chance to spawn, or grow big enough to make a decent meal for a bigger bass. Population density is #1 in growing big fish. You can have water that’s saturated with dissolved oxygen from a top-of-the-line aeration system, great genetics and food out the wazoo and if there are too many mouths for the food the fish are not going to get big. And just as having too many small bass negates stuffing a pond with shad/shiners/crawfish/etc., so having too many small bluegill negates high-protein food and genetics and anything else you might do in an attempt to grow a two-pounder. Optimal conditions for big bass are the worst possible conditions for big bluegill and vice versa. You can’t maximize a pond for both. Is it possible that stocking largemouth into a pond under an acre will result in overpopulated largemouth? Of course – just as it’s possible with a much bigger pond, and it should be your goal in both. A half-acre pond that’s overpopulated with largemouth, is exponentially easier to control than a thirty-acre lake that’s overpopulated with largemouth. In either case, overpopulated largemouth are as much easier to get under control than overpopulated bluegill, as roses are than kudzu. If you’ve never tried to get a stunted-bluegill pond headed in the right direction, it’s roughly akin to trying to dam the Pacific Ocean with a tongue depressor. You need the small bass because they eat most bluegill fry/YOY so that few survive to adulthood, and you get that low population density that is key to growing big fish of any species, and especially so for bluegill due to their prolific breeding habits. 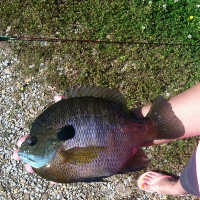 Forget about bass size if you want giant bluegill in your pond. Think of the bass as aspiring runway models, and you’re giving them that slender figure that models yearn for. You’re not starving them – you’re just lowering their incidence of heart disease and Type-II diabetes. Big Bluegill Mistake #2: Stocking competing species for forage. Largemouth bass are named for the size of their food intake valve – they have a big maw, and they’ll stuff it with anything that will fit in it. Bluegill, on the other hand, have one of the smallest mouths of any freshwater fish, and this small mouth size limits what they can eat, even larger specimens. A twelve-inch largemouth can eat bigger food items than any bluegill that ever swam. Why then is it that pond owners – and many pond management professionals – forget this when managing ponds for big bluegill? Three years ago I began managing a 60-acre lake thirty miles from my hometown. The first time I spoke with the owner, he lamented that his bluegill size had decreased dramatically in recent years; after a few questions I learned that the company that managed the lake prior to me had talked the owner into stocking six thousand dollars’ worth of gizzard shad into the lake six years earlier. The owner told me that when he bought the lake, pre-shad, the bluegill had been “huge,” as had been the shellcracker. 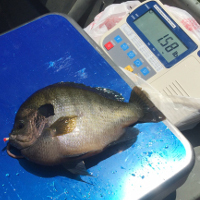 When I sampled the lake a few days later, the bluegill averaged 5″, as did the shellcracker; the largest sunfish I caught was an emaciated seven-inch bluegill with big eyes that lived right under an automatic feeder. The bass in the lake were great – within my first thirty minutes on the lake I saw one that would go between eight and ten pounds. But the bluegill were pathetic. I made a point, in my conversations with the owner, of asking him whether bass or bluegill were more important to him; it became clear that, though he liked to catch nice-sized bass, bluegill and shellcracker were his priority. Most pond professionals these days recognize that the introduction of shad, whether gizzard or threadfin, is almost invariably devastating to the size structure of bluegill in a pond or lake; but, just as there are pond managers out there so focused on bass that they can’t give objective advice on growing big bluegill when it comes to small ponds, so there are some who are so locked in to growing bigger bass that they bring that mindset to every body of water, and rationalize anything that would interfere with it. These same pros are quick to point out that stocking any species of predator that will compete with your largemouth for food – for example, channel catfish, or crappie, or hybrid striped bass – will adversely affect your chances of growing big bass. Why then do they insist that species that compete directly for food with bluegill can be stocked with no harm to the size structure of the bluegill? Bluegill eat invertebrates, as well as (very) small fish, and, especially young bluegill (a crucial time in the fish’s development if you’re trying to grow trophies), plankton. Threadfin and gizzard shad, golden shiners, and tilapia, all consume invertebrates and plankton. And, all of the aforementioned species will also readily consume floating pellets, further depriving your bluegill of calories. 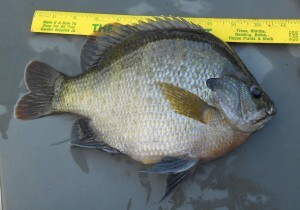 Every invertebrate a shiner or tilapia eats is one less invertebrate one of your bluegill can eat. And shad, both threadfin and gizzard, are filter feeders: they’ll do the same thing in your pond that Asian carp have been reviled for doing in the Mississippi River, meaning they’ll cut your food chain off at the knees, taking away crucial nourishment from bluegill YOY and fry and intermediates. If you don’t believe how much of a difference the food chain makes, my two best bluegill came from ponds that weren’t fed pellets at all – they simply had great food chains from being fertilized monthly from March through October, and high densities of bass being maintained at all times. But it’s not just competition for food that makes other forage species a no-no in trophy bluegill ponds. Stocking shad or shiners or tilapia puts a double-whammy on your pond for bluegill size. All of these species are stocked not just because their fusiform shape makes it easy for bass to eat them: they’re also stocked for their fecundity. They’re spawning machines, and pond managers stock them for the same reason they stock bluegill, to provide lots of food for the bass. But more food means more opportunities for the bass to choose, and when given the choice between easy-to-swallow fusiform shad or shiners or tilapia versus harder-to-swallow compressiform bluegill, the bass will focus on the slender newcomers. Meaning your bluegill get less attention, meaning their ability to breed like rabbits goes unchecked – they overpopulate, and their growth shuts down. I’ve never seen a pond or lake that had a significant population of any of these other species, that didn’t have overpopulated bluegill with sub-par growth. Pond owners sometimes think that the bluegill will benefit from the added forage. And, if bluegill had mouths like bass, they would – but remember that tiny mouth. Shad and shiners and tilapia quickly grow past the size that any but the largest bluegill can eat them, and, particularly with tilapia and gizzard shad, within a couple months of birth they can reach a size at which no bluegill can consume them; and at this point they’re not doing anything for your bluegill but taking food away from them, both the natural food in the pond and any pellets you might be spending good money on. I made the mistake this spring of stocking tilapia into a one-acre pond I manage that has had catastrophically bad watermeal for the entire three years I’ve managed it; I stocked the tilapia against my better judgment, because the pond has a high density of stunted crappie from a bucket stocking by one of the owner’s friends years ago, and I thought the crappie might control the tilapia reproduction. Now every time I go to refill the feeder on that pond I’m greeted by a hundred tilapia that lie just beneath the surface ten feet out from the feeder, waiting for the pellets which they greedily devour the second the feeder goes off. Before I stocked the tilapia, I could see dozens of coppernose bluegill to ten inches feeding whenever the feeder went off; now I haven’t seen a coppernose in two months. The tilapia have completely taken over the feeder. Focus on keeping bluegill numbers low if you want to grow trophies. Density is key – even more important than supplemental feeding. 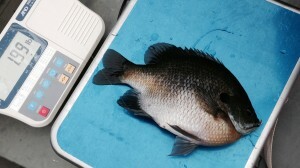 And your bluegill density will get out of whack if you stock one of these other species – I guarantee it. 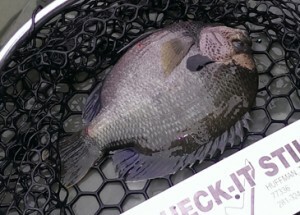 Big Bluegill Mistake #3: Too much cover and/or shallow water. Cover is key for growing big bass – without cover for your forage, the bass will be able to chase down too many of the forage fish and eventually deplete them so that there’s not enough food to go around, and growth stops. 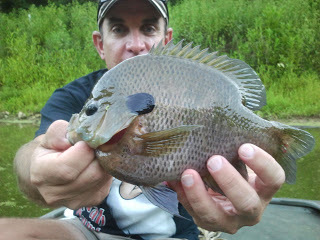 And, here again, if big bluegill are your goal, you need to take that bass thinking and flip it on its head. One caveat: this subject has been, in my experience, not as cut-and-dried as mistakes #1 and #2. The best bluegill pond I ever managed had dozens of fallen trees in the water, all around the lake; at least three-fourths of the shoreline had cover in the water. But that pond also had no weedgrowth at all, very little water shallower than two feet, and easily the densest population of small largemouth of any pond I’ve ever fished – it was common to catch more buck bass in a day of fishing than bluegill, but the bluegill would average nearly a pound apiece. I’ve also fished ponds that had dense weedgrowth but still harbored thriving populations of large bluegill; but in every case these ponds had a high density of small bass, and I’ve only encountered a handful of ponds that featured this combination. Conversely, when I sample a new property with multiple ponds on it, I can usually predict without wetting a line which ponds will have the biggest bluegill, just by observing the relative abundance of cover in each pond. A year ago I began managing a mountaintop property with several lakes ranging in size from eight to 120 acres. There were two lakes that had significant weedgrowth, and a third lake that had a preponderance of shallow water; these lakes had the largest bass and the poorest bluegill, while the deeper lakes with no vegetation and comparatively little cover had more small bass, and much larger bluegill. Here’s an easy way to think about it: the state of Louisiana is further south than most of the state of Alabama, and probably has more water with dense cover than any other state; the state record bluegill is under two pounds. Lake Ketona, a small private lake outside of Birmingham that produced the world record four-pound-twelve-ounce bluegill, is an old limestone quarry with steep sides, almost no water under three feet deep and no cover. It also has an unusually high density of largemouth, or at least it did at the time of the world record catch, because state biologists cited the bass density, along with the steep banks and lack of cover, as reasons for the record fish. Pond owners often ask if they should build spawning areas for their bluegill. The answer is, if your goal is big bass, absolutely – gravel beds will do the same thing fish hides will, i.e. 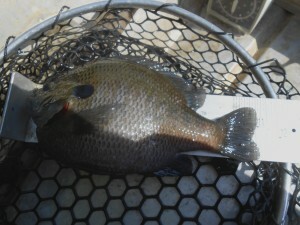 increase the spawning success of your bluegill. But that spawning success is your enemy if trophy bluegill are your goal, just as great bass spawning success is the enemy of a pond owner aiming for trophy bass. Density is key. And part of how you control it is to give the bass an easy shot at your small bluegill. Most of them will get eaten – and that’s what you want.